Machu Picchu was hidden from the eyes of the Spanish authority in Peru for centuries until it was “discovered” in 1911 (the local Quechua, descendants of the original Incas, had always known it was there). Since it was re-founded, it has been an important tourist attraction up to the present day. Now scientists are studying the lost city to learn why it has existed for so long in a fairly earthquake-prone area. A research expedition, called the Cuzco-Pata Rsearch Project, has discovered that from all signs of some parts of the buildings that were built had sustained damage during a massive earthquake at around 1450 A.D. According to the cracks in some of the smaller rock formations and from what historical records there are (from after the Spanish Conquest), during the era of the ninth Inca Emperor Pachacutec, a massive earthquake struck the area and caused many of the foundations of the buildings to crack. 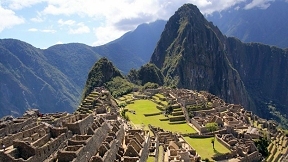 Under normal circumstances the whole project of Machu Picchu should have been abandoned. We know this did not what happen. The whole city was completed, and lived in until it was believed to have been abandoned. No one is sure when it was abandoned. When the Inca Empire was destroyed by the Spanish in 1532, it is believed that the last of the Inca aristocracy fled to Machu Picchu. For some reason the whole city itself was abandoned between 1533-1572, when the last Inca capital fell to the Spanish. After that, the place was forgotten until 1911. But how did Machu Picchu survive fairly intact from when it was abandoned until it was found again? The answer is how the Inca architects virtually rebuilt the city after the massive earthquake in 1450. Instead of using the small foundation stones that had some space between them, the Inca architects switched to very large foundation stones cut and shaped to fit closely together. So closely together that not even a knife’s blade could be inserted between them. These special massive stones became the foundation of the buildings of Machu Picchu and the means by which the temples, palaces and public buildings of Machu Picchu would survive not only earthquakes but also serve as a refuge from any hostile Native South American threat against the Incas (it served as a refuge for a time against the Spanish). To make sure that Machu Picchu could survive independently of any attack, it was built next to a river which was used for irrigation for crops (the special irrigation system the Incas built to keep the water flowing still works to this day), and special storage areas were built so that in case of invasion or drought there was stored food to keep the local population alive for years. Also, narrow footpaths had been constructed so that an enemy would find it almost impossible to go up to the mountain to attack. Even the Spanish would have had a hard time getting up to Machu Picchu, so the place was never conquered. Clearly much thought had gone into building the city, and why it has stood for so long. The Incas still have many secrets that we are only beginning to understand now, and the Cuzco-Pata Research Project is ongoing to try and learn more about what those secrets might be.